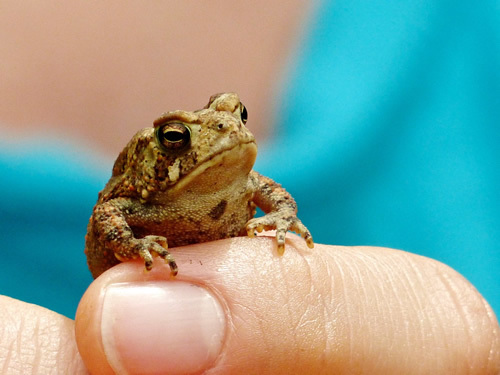 Comments: Toads eat insects, so whenever I find one, I release it in my garden. 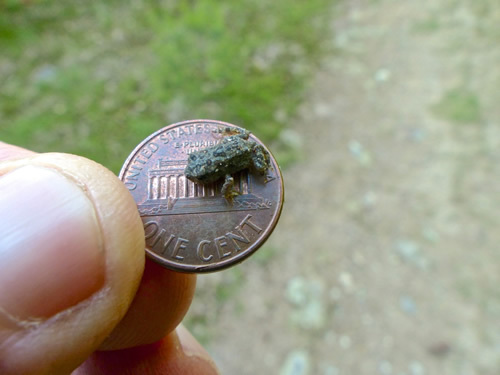 Comments: Note toe of shoe in photo to get an idea of the small size of this toad. 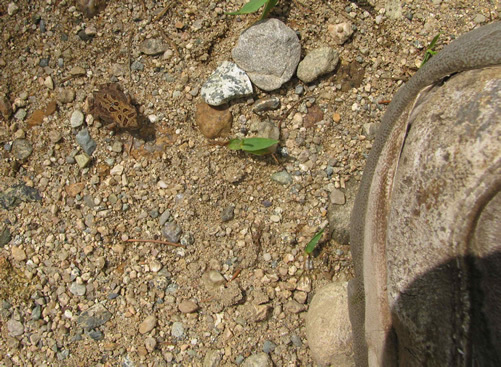 Comments: Notice how well this toad is camouflaged. Comments: In the crux of a spruce that has a divided trunk. 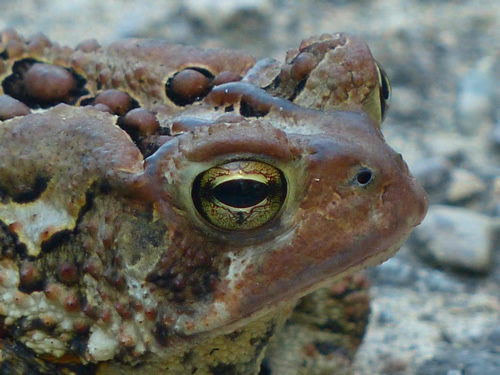 But the story is, we just thought it was a toad, however I went to Franklin Park zoo this past Saturday 10/27, and there was a picture of the exact same type of frog! 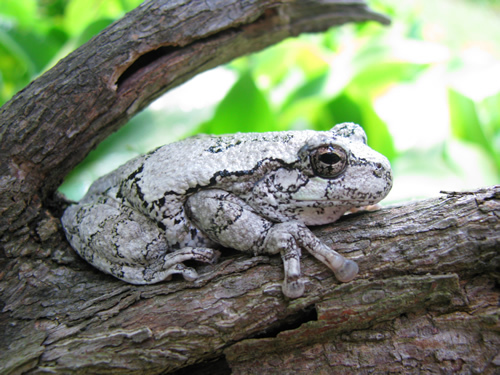 More Information: Learn what a gray tree frog call sounds like at: music of nature, so you don’t wrack your brains trying to figure out what kind of bird it is. Comments: While watering the garden, this tree frog revealed itself in a bush. 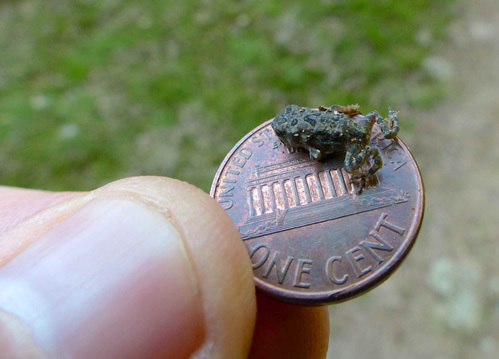 Comments: This is one of our most familiar frogs, and is found statewide. It has some green on its face and a mostly brown body, with a ridge running down each side of its back. 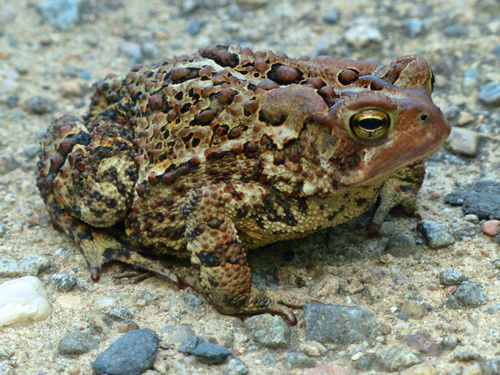 This species prefers permanent or semipermanent water bodies (rather than vernal pools that dry up in summer), eating whatever it can grab, mostly insects but occasionally small snakes and even birds. 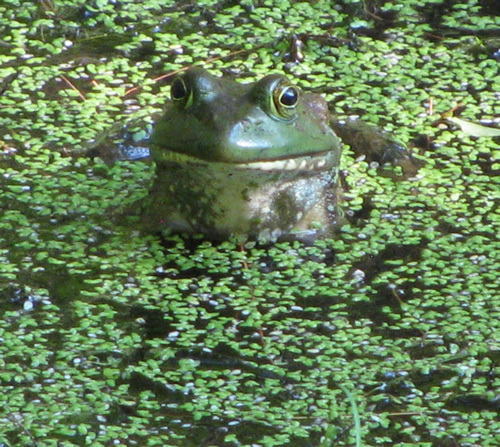 The call is a banjo-like “gunk.” The female lays a thousand or more eggs at a time as a film on the water’s surface. Observation Location: Massapoag Sportsmen’s Club, Belcher St. 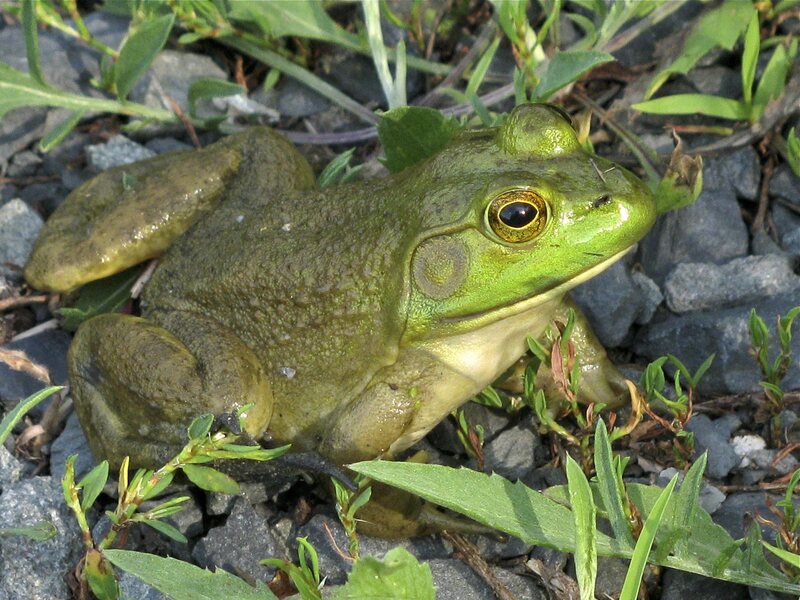 Comments: This is one of our most familiar frogs and is found statewide. 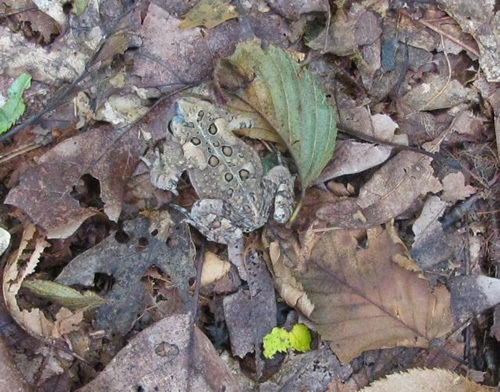 It has a green face and a green-brown body, and a ridge running down each of its sides. 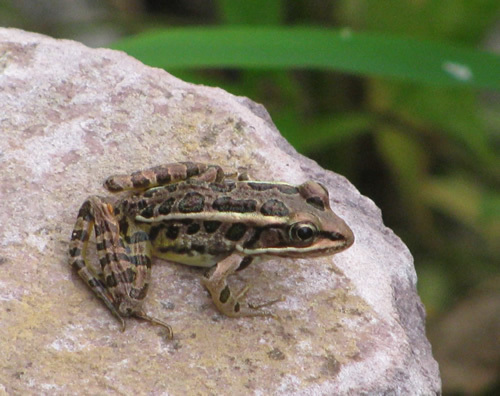 This species prefers permanent or semipermanent water bodies, eating whatever it can grab, mostly insects but occasionally small snakes and even birds. 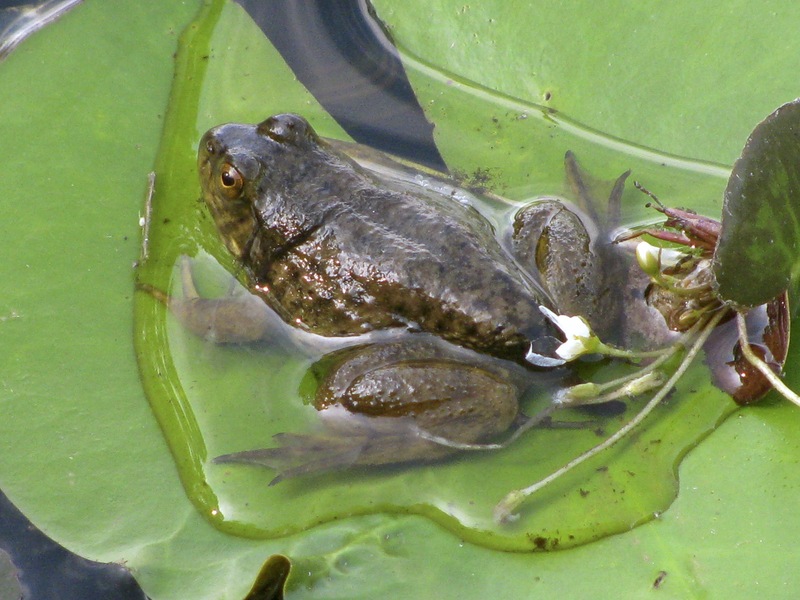 The call is a banjo-like “gunk.” The female lays a thousand or more eggs at a time as a film on the water’s surface. 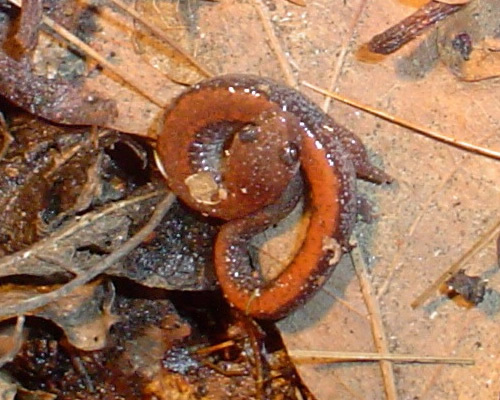 Comments: The lead-backed salamander is a color variant of the red-backed salamander. They live under rotting logs. Comments: The skin secretions of a stressed pickerel frog are known to be toxic to other frogs, as many a novice frog catcher has found when he finds only the pickerel frogs still alive in his bucket. These secretions can also be moderately irritating if they come in contact with the eyes, mucous membranes, or broken skin. 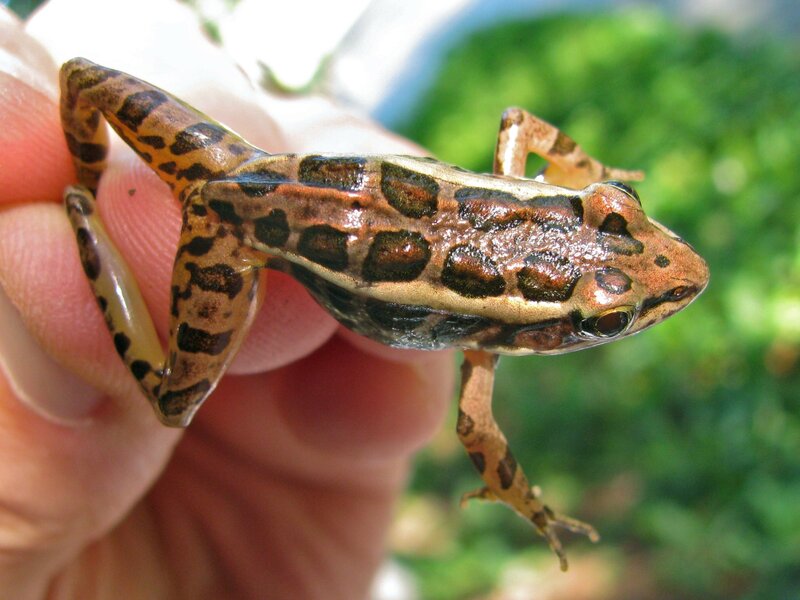 It is advisable to wash one’s hands after handling pickerel frogs. 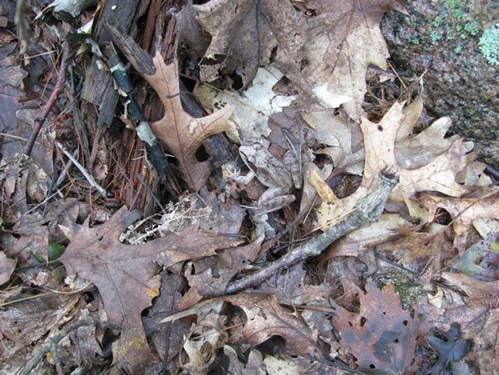 Comments: Red-backed salamanders can be found by turning over rotting logs in the woods. 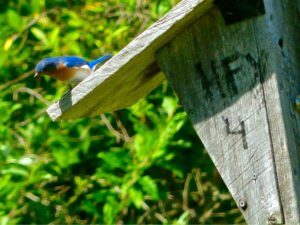 PS – Read about the salamander migration at Moose Hill in 2008. Comments: Very well camouflaged in center of photo. Comments: Rainy night; stopped car to watch it cross the road; told the neighbor driving behind me and he came out to watch: he had never seen one before. 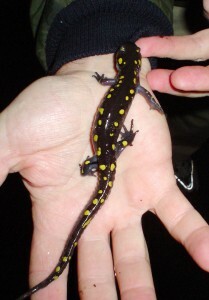 More Information: Read about the salamander migration at Moose Hill in 2008. Comments: Was it the same one I had seen the night before crossing the road? I suspect there are lots of them! Gave a note to all neighbors on Mountain St from Hampton Rd to dirt road to be on the lookout as they drive home on rainy nights. Comments: It’s best not to handle salamanders because the salts and oils on your skin don’t do amphibians any good (mea culpa!). 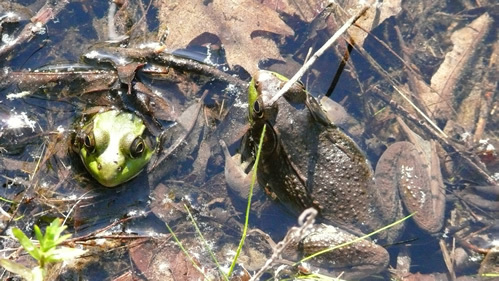 To see a variety of frog and salamander species, walk down Moose Hill Street on the first rainy night after the snow melts in late March. 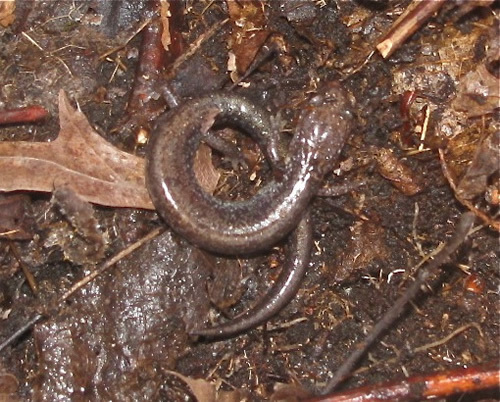 That’s when mole salamanders migrate from their their burrows to nearby wetlands to spawn.